Many countries are investing heavily in climate change adaptation. To plan, implement and track their investments, they need robust assessments of the expected and actual returns. Is adaptation keeping development on course and is it distributing costs and benefits fairly? 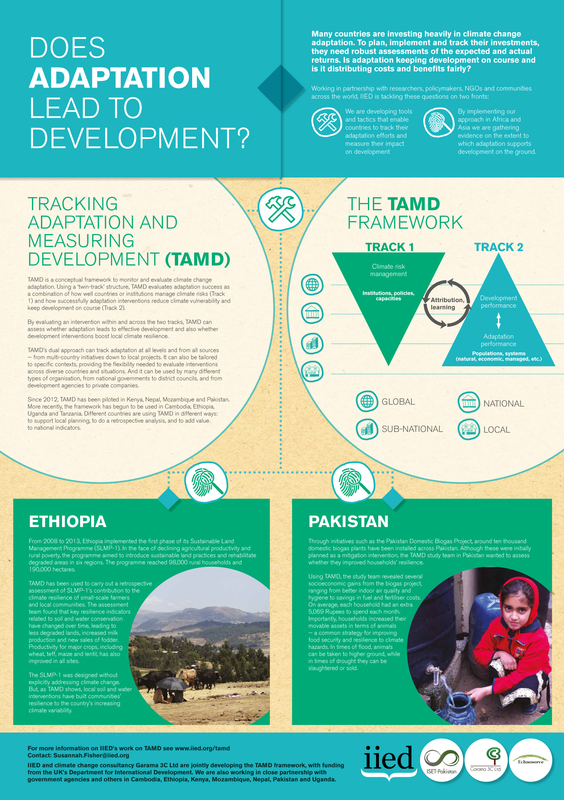 TAMD is a conceptual framework to monitor and evaluate climate change adaptation. Using a ‘twin-track’ structure, TAMD evaluates adaptation success as a combination of how well countries or institutions manage climate risks and how successfully adaptation interventions reduce climate vulnerability and keep development on course. By evaluating an intervention within and across the two tracks, TAMD can assess whether adaptation leads to effective development and also whether development interventions boost local climate resilience. TAMD’s dual approach can track adaptation at all levels and from all sources — from multi-country initiatives down to local projects. It can also be tailored to specific contexts, providing the flexibility needed to evaluate interventions across diverse countries and situations. And it can be used by many different types of organisation, from national governments to district councils, and from development agencies to private companies. Since 2012, TAMD has been piloted in Kenya, Nepal, Mozambique and Pakistan. More recently, the framework has begun to be used in Cambodia, Ethiopia, Uganda and Tanzania. Different countries are using TAMD in different ways: to support local planning, to do a retrospective analysis, and to add value to national indicators. From 2008 to 2013, Ethiopia implemented the first phase of its Sustainable Land Management Programme (SLMP-1). In the face of declining agricultural productivity and rural poverty, the programme aimed to introduce sustainable land practices and rehabilitate degraded areas in six regions. The programme reached 98,000 rural households and 190,000 hectares. TAMD has been used to carry out a retrospective assessment of SLMP-1’s contribution to the climate resilience of small-scale farmers and local communities. The assessment team found that key resilience indicators related to soil and water conservation have changed over time, leading to less degraded lands, increased milk production and new sales of fodder. Productivity for major crops, including wheat, teff, maize and lentil, has also improved in all sites. The SLMP-1 was designed without explicitly addressing climate change. But, as TAMD shows, local soil and water interventions have built communities’ resilience to the country’s increasing climate variability. This poster was produced by Susannah Fisher, IIED.